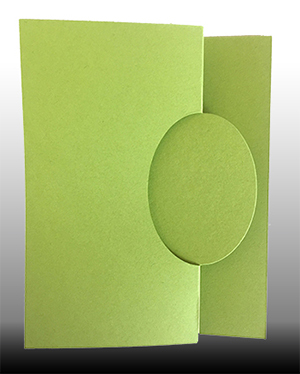 Specially die cut and scored card that Z Folds with a die cut OVAL that swing from the front to the inside of the card. Oval is 1.88" x 2.67"
Folded Card size is 4.25" x 5.5". BULK Variety includes 12 colors - the 6 shown, plus Lemon Drop, Orange Fizz, Cream, Pewter, Grape Jelly & RazzleBerry. NOTE: colors not shown are only available in the variety package and NOT available in a solid color packages.